Some friends of mine have been trying the Veganuary challenge but I’m not as brave to go the whole way. See? It has taken me until the last day of January to even post these Raspberry Vegan Macarons! Flexitarian is my name: I rarely eat red meat, stick to poultry and fish as much as possible – in between at least a few vegetarian weekly meals. To be a vegan means carrying on eating a deliciously crispy French baguette but cutting out all that gorgeous unpasteurised French cheese, butter, milk and organic eggs etc. I’m simply not ready to give them up yet. However, I do enjoy my healthy maple oat granola or spiced granola in the mornings with almond milk and, on occasion, make these energy bites in the form of dried fruit spicy snowballs. That’s it, really. So why am I making these Raspberry Vegan Macarons so late in the day? I love a challenge and besides, I want to see what all the fuss is about. 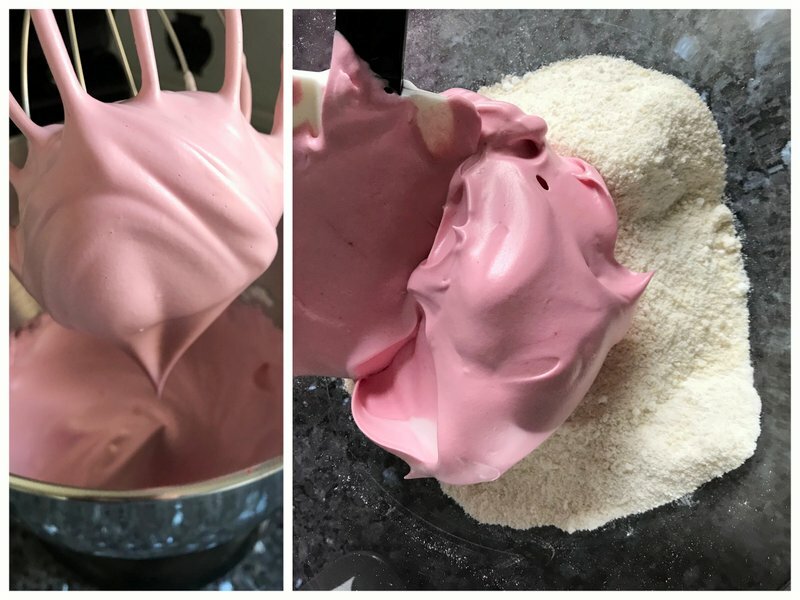 Aquafaba – it is miraculous to watch how this fancy name for the brine of tinned chickpeas or beans can go from a simple thick brown reduced liquid to a whipped up, shiny, regular-looking meringue. It looks like it’s made from egg whites but it’s easy to be fooled in the looks department: it’s entirely vegan with no eggs used! As with my regular macaron recipes in my books using egg whites, I use the French meringue method – so no candy thermometers are needed. It’s a lot easier, producing just as good results. All was going well, just as I would be making regular gluten-free French meringue macarons by my books. Once I’d completed the macaronnage (basically the mixing of the batter to eliminate air bubbles and produce a shiny texture) it looked ready to pipe out the shells, even if a bit thicker than I’m used to. Piping out the mixture, the batter was indeed thicker and a bit grainier than for my regular macarons and, therefore, susceptible to having pointy tops (I shall refrain here from what I normally call them!). Apart from that, no problem. As for regular macarons, leave them to sit out and air for at least 30 minutes. Even using aquafaba for vegan macarons, the effect is the same: the outer layer becomes quite hard to the touch. Once this happens, they’re ready to bake. I knew that Aquafaba doesn’t like high temperatures and for making aquafaba meringue, it prefers lower temperatures much like for normal meringues. 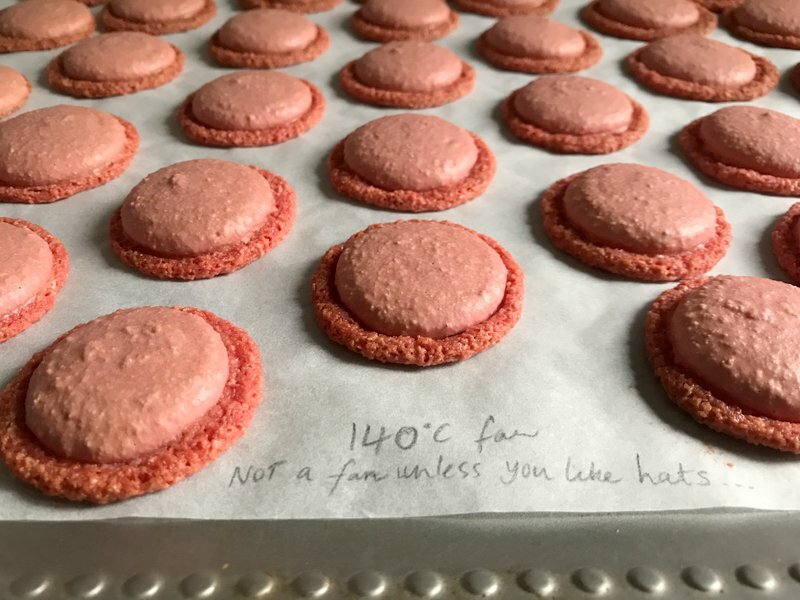 So, I reduced the oven slightly from my usual macaron temperature to 140°C fan just to try out the first batch. Oh-oh. A totally maca-wrong move. 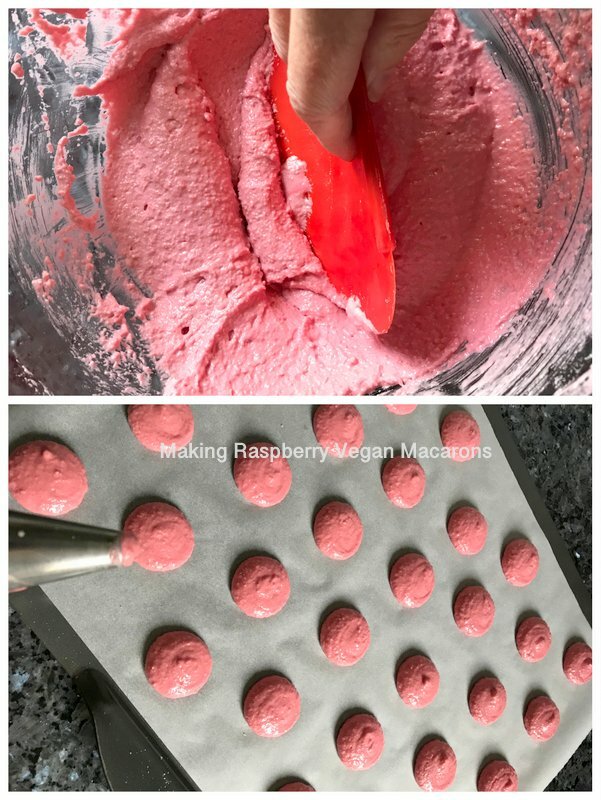 Rasbperry Vegan Macarons – Learning that oven temp is NOT the same as for making regular macarons! Clearly that first batch wasn’t right! The temperature was still FAR TOO HIGH. As with making regular macarons, I bake the trays one at a time; just as well, as at least I didn’t ruin the rest of the batter! I could easily correct it by reducing the oven temperature to 110°C fan (130°C) for the next batch. Bingo! It worked. For the vegan filling, I personally find it’s not that easy to find tasty vegan ideas to sandwich the shells together, as I can’t use the normal chocolate ganaches or buttercreams. The easiest to hand was homemade raspberry jam (reheated with some lemon verbena leaves and left to cool). Another easy alternative is classic peanut butter but that would look strange with pink. When ready to eat next day, I sprinkled them with some freeze-dried raspberry powder for that extra raspberry flavour. Picture perfect raspberry vegan macarons, made with Aquafaba (brine from tinned chickpeas) French meringue and filled with lemon verbena infused raspberry jam. Drain the brine/liquid from a 400g tin of chickpeas into a saucepan. Reduce the liquid (uncovered) on low-medium heat for about 10 minutes until reduced to about 2/3. Leave to cool then refrigerate overnight. Using a stand mixer (or with electric hand beaters), whisk the aquafaba and cream of tartare in a large bowl, adding the caster sugar gradually once it starts to foam. Continue to whisk, gradually on high speed for 10 minutes or until the aquafaba starts to form firm, glossy peaks. If using, add a good pinch of pink powdered food colouring. Sift the ground almonds and icing sugar into a large bowl, putting aside any leftover bits of almonds for decorating desserts later. Add the whipped aquafaba and, using a good flexible spatula, mix the ingredients together until combined. Beat out any air using pastry scraper, continuing back and forward until the batter is glossy and falls off the scraper. Transfer the batter to a piping bag with a plain tip (8mm). Line 2 flat baking trays with baking parchment (I prefer this to a silicone mat, as it's easier to produce feet). Pipe out small rounds, leaving enough space between each (they will spread in the oven slightly) . Leave the trays out to air for about 30 minutes until they are quite hard to the touch. If still too soft, leave out for longer. Preheat the oven to 130°C/110°C fan/250°F/Gas 1/2. Bake each tray separately for 15 minutes. Turn the oven off and leave the tray in the oven with the door open for a further 15 minutes (this sounds cumbersome but after experimenting was the best way for this recipe). Leave to cool. For the filling: Arrange the macaron shells into pairs and marry each couple together by piping out one half with raspberry jam, top with the other shell then set aside in the fridge for 24 hours. (I heated up a quarter of a jar of raspberry jam with a few lemon verbena leaves and left the jam to cool). Add the leftover chickpeas to this Moroccan-style spicy Chicken & Prune Tagine, for example. For regular macaron recipes using egg whites, see the recipes in both my books, Mad About Macarons and Teatime in Paris. 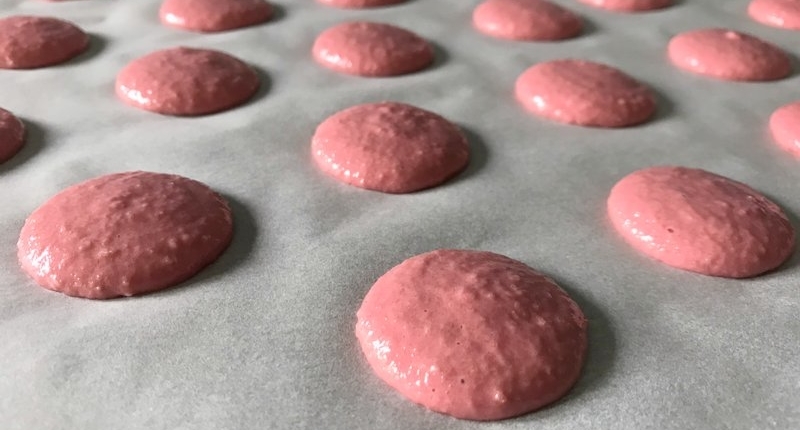 When baking vegan macarons, it’s totally different to baking regular Parisian macarons: the vegan aquafaba meringue prefers a lower oven temperature and baked (much like meringues) for longer. At first glance, we could be convinced that they look like regular macarons using egg whites. They’re not quite as picture perfect compared to my classic Parisian macarons. To be brutally honest, I wasn’t prepared to perfect the recipe just to make them look perfect. For me, the most important element in French patisserie is taste before looks. Their taste, however, is nothing like regular macaron shells – no matter how much you hear, “Don’t worry; it will taste better in the end”. I added vanilla powder and some natural raspberry powder, just to help it along the way for flavour points, but the truth is the eventual taste of the shells is strange: definitely sweet but there is the “weird” sensation with the aftertaste of, well, something like chick peas. Although it’s comforting to know we can produce macaron-looking treats for vegans, I’m sticking to my own traditional French-meringue macarons using egg whites. 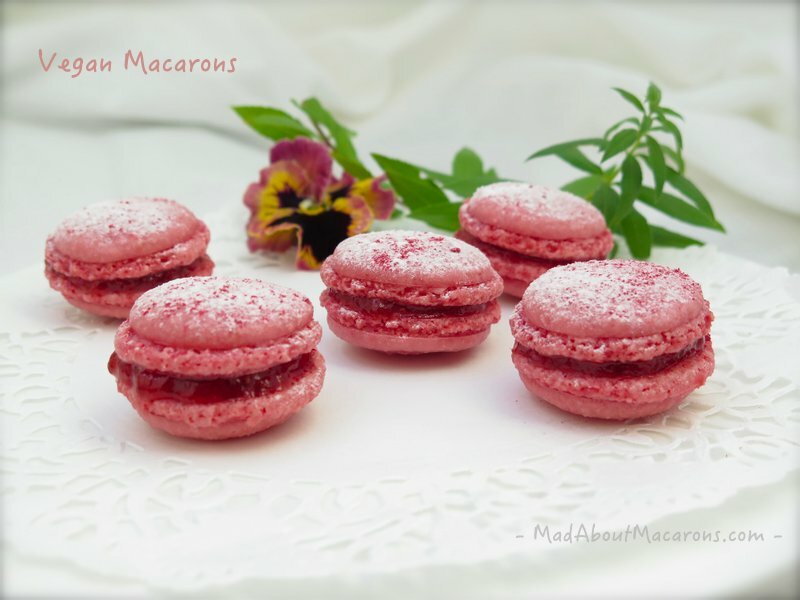 For my Parisian macaron recipes, you’ll find most of them in Mad About Macarons! , along with detailed step-by-step instructions and in the chapter devoted to macarons in my latest book, Teatime in Paris. 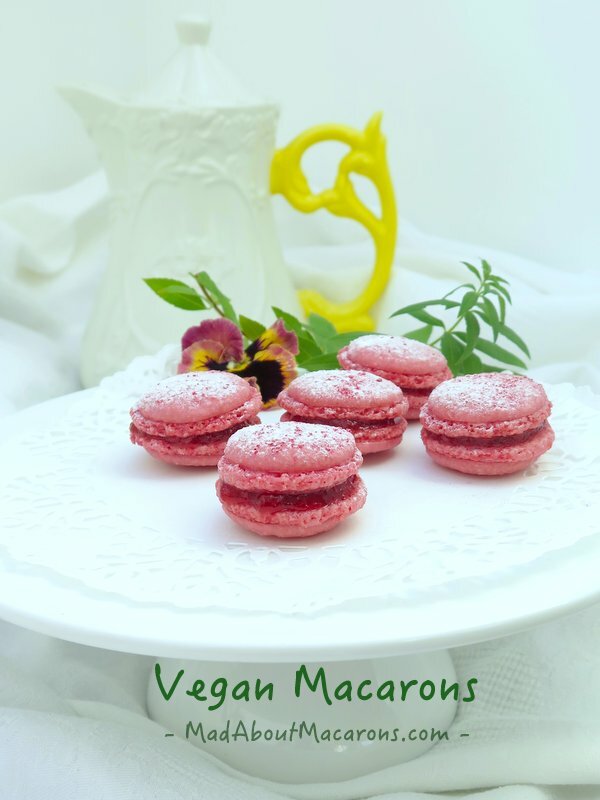 Tags: aquafaba french meringue, aquafaba vegan macaron recipe, how to bake with aquafaba, troubleshooting vegan macarons, vegan macarons recipe, what is aquafaba? Goodness Jill, how many times have I thrown away the brine of tinned chickpeas and beans never knowing it could be whipped up as shown. I appreciate you taking the time to make macarons for vegans and found it interesting but I prefer your classic recipes with egg whites which work very well for me. Also I didn’t know you can buy raspberry powder. Hehe – I thought exactly the same when I was making a chickpea salad and keeping aside that brown, thick brine! Isn’t that funny? Yes, I also prefer the taste of traditional Parisian macarons. I’m not convinced of the taste of acquafaba, to be honest. I’m sure you can find raspberry powder in health food stores. Yes, Jill. Now i understand. As you know we don’t eat red meat at all but no way i would give up “a proper macaron”… and chick peas aftertaste doesn’t sound appealing. ? Huge thanks for sharing. And no matter what they look gorgeous. Thanks, Natasha. I just couldn’t hide it. They look pretty, don’t they? But I have to tell the truth here. If it’s not up to the taste challenge, then I’m clearly not ready for veganism when it comes to meringues, anyway. How does egg white sound appealing either? Because you are used to them. I have made vegan meringues and I can tell you once you have whipped the aquafaba and added the sugar, there is no strange after taste. Everyone has their own tastes, Tom. Thanks so much, Liz. Appreciate you popping in! Guess what? We’re on the same page again! I’ve just made vegan doughnuts and will be sharing the recipe soon! Crazy, huh? Well, your vegan macarons look absolutely MARVELOUS! Well done, Jill! I bet the raspberry flavor is fantastic, too! Well, it will be interesting to hear your conclusions on the taste of your doughnuts, as you need to read the end of this post. Just felt that I had to give vegan macarons a try at least. 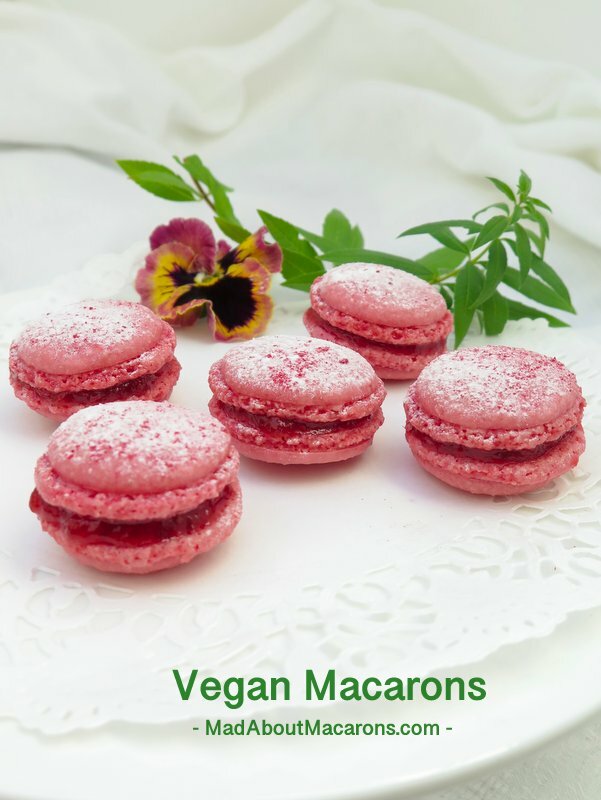 Very interested to read about the results of your experiment with these vegan macarons. I am especially glad to hear your views about the taste. I have to tell you, I attended a tea once, hosted by the record label 4AD and vegan pastries were served. I really wanted to like them (because it was an event I had looked forward to for weeks), but they just did nothing for me. Glad to know you still prefer the wonderful effects of butter, eggs and cream on baking!! Isn’t that interesting, Betty? To be honest, it also depends on the ingredients and type of vegan produce. I’ve had some vegan pastries from the Shangri-La in Paris, for example, and couldn’t believe they were vegan – they were SO good. But on reflection, none of them were meringues or macarons. I’m definitely not convinced with the aftertaste that aquafaba leaves. Not much luck for you either, then. I’m sure there are other wonderful vegan desserts that have a wonderful taste.